Most new vehicles automatically come with “steel wheels”, fitted by the manufacturer. Steel wheels are more resilient to damage and are considerably cheaper to fit. Unfortunately they are almost always heavier, less attractive and smaller in both diameter and width than alloy wheels. What is an alloy wheel? What does Offset mean ? Are special tires required for installing alloy wheels? Are tubeless tires required for alloy wheels? 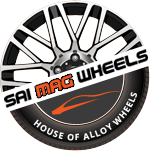 Is balancing and alignment necessary while installing alloy wheels? Do you get common alloy wheels, which fit on all the cars? What does Plus-Sizing or Up-Stepping mean? What are alloy wheels locking nuts and locking bolts? The term alloy wheels is usually given to wheels 'cast' from a mixture of aluminum instead of steel, making the tires light weight even though they’re usually larger in size than the factory fitted steel wheels. They aluminum helps dissipating heat and small amounts of more rigid metals whose presence in the 'mix' provides rigidity and helps prevent cracks propagating. A variety of designs to choose according to ones taste. Light weight ( hence low unsprung weight ) resulting in lower inertia being imparted to the springs while riding over a bump. Lighter rotational mass improves acceleration , braking and fuel efficiency . Better road holding ( tire remains in contact with the running surface longer ). Better braking ( wheel hop under traction is reduced ). Longer tire life because of better heat dissipation (alloy wheels are better conductor of heat) . Tires fitted on alloy wheels are on an average 10% cooler than the normal rims particularly at high speeds . Cooler tires wear out more slowly. Reduced and even tire wear because alloy wheel is invariable and perfectly true. No corrosion or rust since special aluminium alloys are used . Perfectly round and balanced hence no wobbling even at high speed. Completely air tight hence perfectly suitable for modern tubeless tires. Enhanced cooling of disks and drums . Less prone to bending and deformations , hence improved balance retention . Superior rigidity improves cornering , lateral stability , better steering & handling . Positive Offset wheels have their mounting face toward the front face of the wheel. Most front wheel drive vehicles have positive ET wheels. 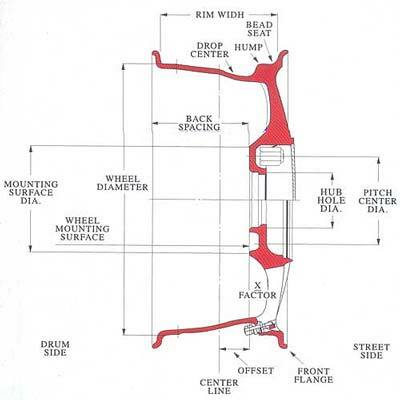 Zero offset wheels have their mounting face even with the centerline of the wheel and are by definition "ET 0". Negative Offset wheels have their mounting face toward the rear of the wheel - powerful rear-wheel drive cars often have wheels with negative offset. PCD stands for 'pitch circle diameter' and is the diameter of a circle drawn through the centre of your wheel's bolt holes. P.C.D. is measured in millimeters and also indicates the number of studs or bolts the wheel will have. There is no requirement of special tires to install alloy wheels. Standard tires given by the car manufacturer are perfectly compatible with the wheels. No, tubeless tires are not required for alloy wheels, however they are compatible with alloy wheels. Just like any other steel wheels, balancing is necessary while installing alloy wheels to strike a perfect balance between the tires and wheels. This is necessary to avoid wobbling and uneven wear and tear. No every car has different bolt pattern, but there are vehicles, which share a common bolt pattern for which common wheels are applicable and available. Plus-Sizing or Up-Stepping are two terms given to the practice of increasing the diameter of your wheels whilst simultaneously reducing the profile of your tires to keep the overall rolling radius the same. Plus sizing helps improve the handling of the car. In order to maintain the finish on your alloy wheels it is recommended that you use a mild soap with water based solution and clean with a soft un-abrasive cloth. Please do not use any kind of chemicals, household cleaners or detergents. Avoid using Aluminum polish on chrome, painted or clear coated wheels.